I actively involve students in my research. 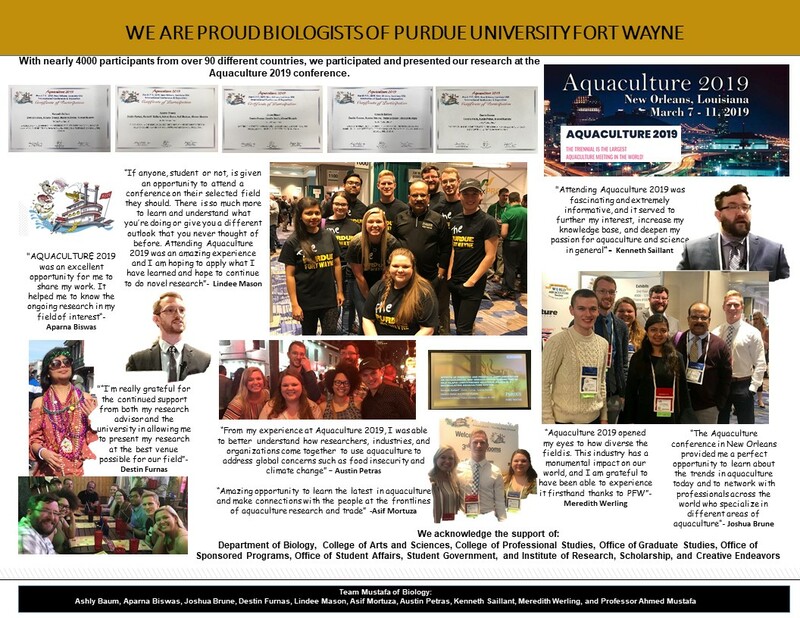 Under my tutelage, many students have successfully received grants to support their own research, presented findings at regional, national, and international scientific meetings, and received co-authorships in peer-reviewed publications. Many of those students went on to pursue graduate work in doctoral, medical, and pharmacy degrees. I earned a Bachelor of Science with honors and a Master of Science from Dhaka University, Bangladesh, a Candidatus Magisterri from University of Bergen, Norway, and a Ph.D. from the University of New-Brunswick, Canada. From the University of New-Brunswick, Canada, I have also earned a Diploma in University Teaching. All my degrees are with highest distinctions. I have obtained numerous research and teaching grants to support my research, published 5 text books, and more than 130 peer-reviewed research articles that have resulted in more than 750 citations globally. I also work as editors and reviewers for several journals, as external reviewers for global promotion and tenure cases, and as expert evaluators for international Ph.D. dissertations. As part of my commitment to students and campus life, I have been serving as the faculty advisor to the Bangladesh Students’ Association and Tri-Beta Biological Honor Society, in addition to my role as Vice President of the Honor Society of Phi Kappa Phi. 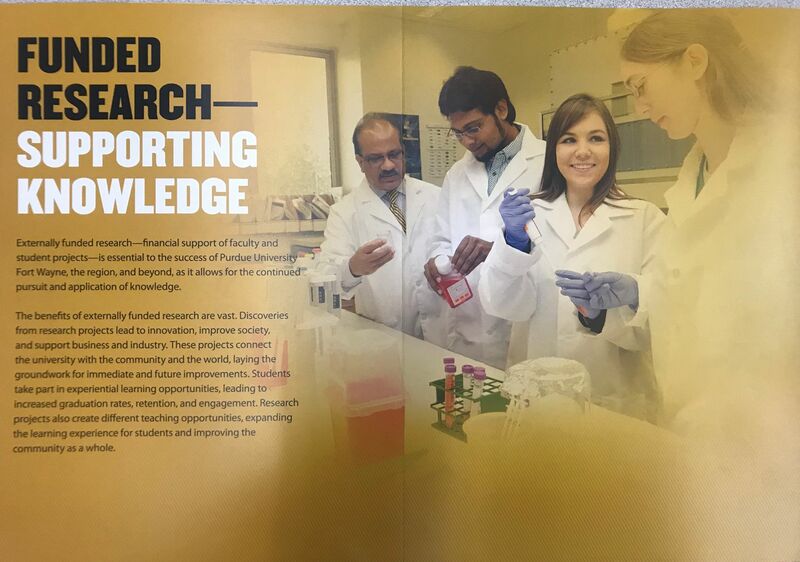 I have also been serving as the academic advisor for pharmacy students. I have received numerous awards in recognition of my outstanding contributions to the campus community including the Teacher of the Year Award from Sigma Xi American Research Society, Outstanding Teacher Award from the Friends of the University, Student’s Choice Award for Excellence in Teaching from the Student Government, Advisor of the Year Award from the Student Government, Pippert Science Research Scholar Award from the College of Arts and Sciences, Community Advisory Council Service to Students Award from the University Chancellor, and a Special Service Award from the Biology Honors Society. 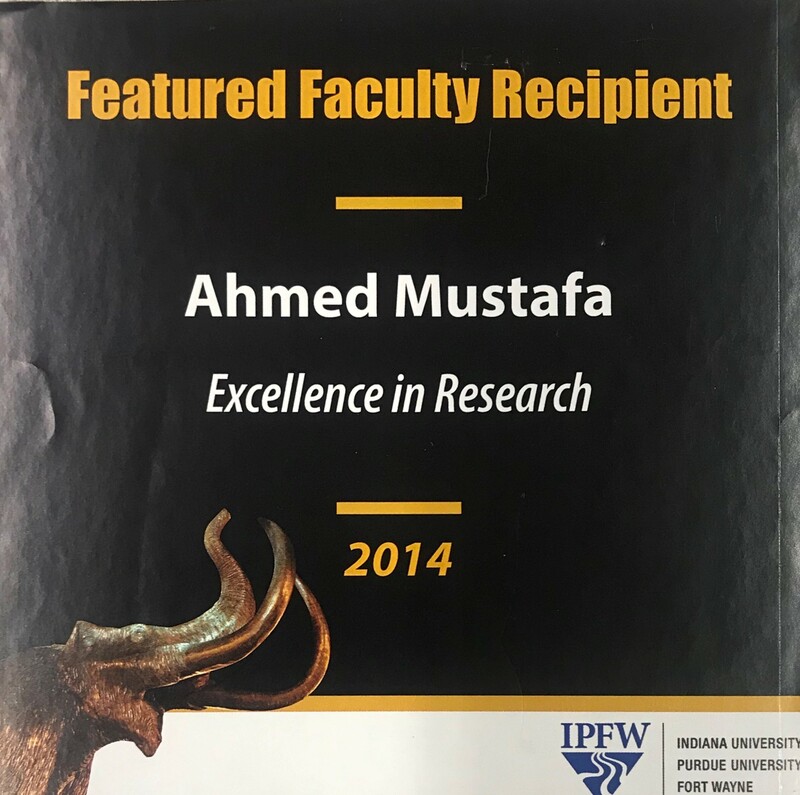 Purdue University in Fort Wayne has selected me as the 2014 Featured Faculty for Excellence in Research and 2018 Featured Faculty for Excellence in Teaching. Featured Faculty is the university campaign that publicizes the range and significance of the intellectual contributions of the faculty. Below is a list of courses I teach. 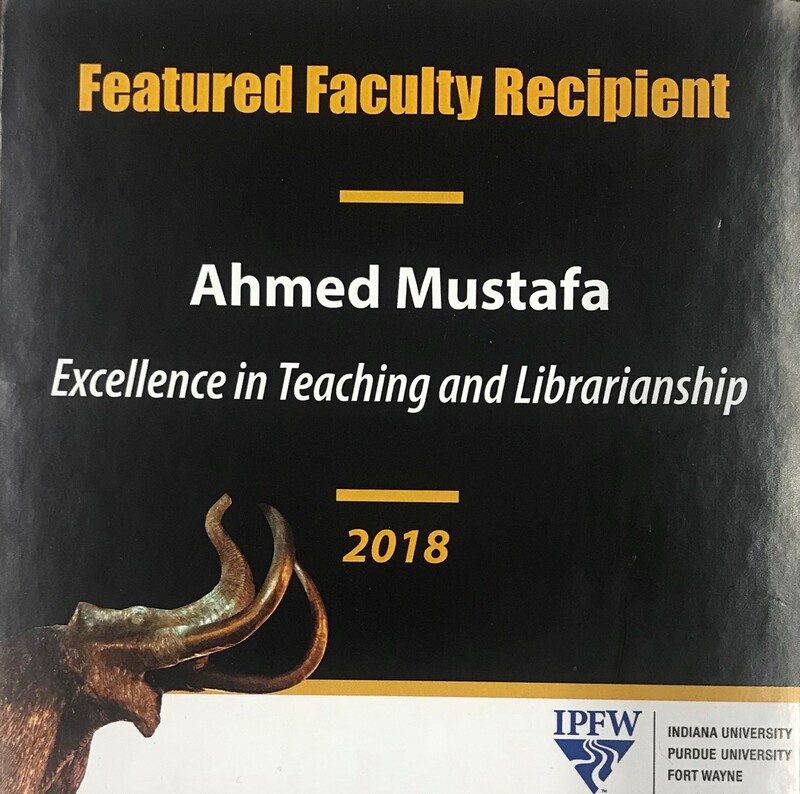 If you are currently enrolled in one of the courses that I teach, you can access the syllabus, lecture outlines, lecture notes, exams, grades, and other supporting materials via Blackboard Learn using your IPFW login and password. [Detailed Course Information]. This is a Science Education for New Civic Engagements and Responsibilities (SENCER) Model Course to connect learning through civic engagement and personal responsibility, and helping students develop ethical sensibilities (Partial support for the development of this course was provided by the National Science Foundation’s Course, Curriculum and Laboratory Improvement Program). 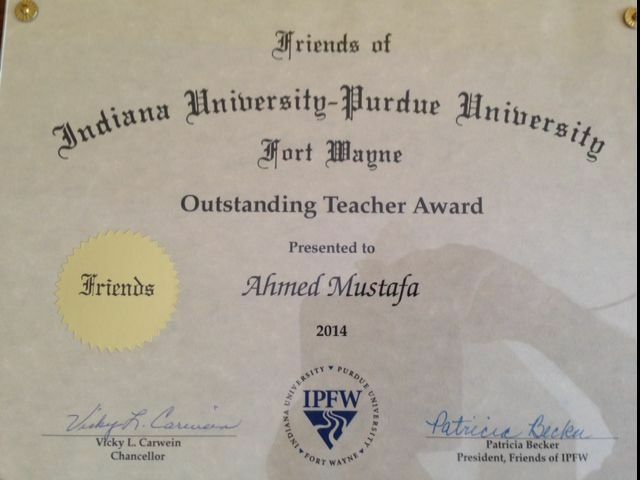 A letter of appreciation from the Honorable Governor of Indiana. A letter of appreciation from a former student. Brown, R., Dhawale, S., Mustafa, A., and Freeman, S. Investigating students’ self-assessed interest in civic engagement and their scientific understanding and skills: an exploratory examination. Science Education and Civic Engagement: An International Journal (Submitted). Michael Cooper, Shree Dhawale, Ahmed Mustafa. 2009. Teaching Stress Physiology Using Zebrafish (Danio rerio). Bioscene, 35 (1): 29-34. Ahmed Mustafa and Elliott Blumenthal. 2013. Pharmacology Supplement, 2nd Edition. Kendall Hunt Publishing Company, Dubuque. IA. ISBN: 978-1-4652-3654-8. Elliott Blumenthal and Ahmed Mustafa. 2010. Pharmacology Supplement. Kendall Hunt Publishing Company, Dubuque. IA. ISBN: 978-0-7575-7153-4. Ahmed Mustafa. 2013. Functional Biology. Pearsons, Boston, MA. IA. ISBN: 1-269-22543-X; 978-1-269-22543-4. Sharon Freeman, Shree Dhawale, and Ahmed Mustafa. 2012. Psychology. Pearsons, Boston, MA. IA. ISBN: 10: 1-256-25021-X; 978-1-256-25021-0. Sharon Freeman, Shree Dhawale, and Ahmed Mustafa. 2012. Symbiosis. Pearsons, Boston, MA. IA. ISBN: 10: 1-256-25022-8; 978-1-256-25022-7. Xuan Qiu, Alejandro Buentello, Regina Shannon, Ahmed Mustafa and D. Allen Davis, 2017. Evaluation of three novel soybean ingredients as primary protein sources and a yeast-based additive as a supplement in practical diets for Pacific white shrimp Litopenaeus vannamei. Aquaculture Nutrition. January 31, 2017. 1-11, DOI: 10.1111/anu.12545. Tiffany Hough, Christina Glaze, Elliott Blumenthal & Ahmed Mustafa. 2016. Effects of omega-3 fatty acid supplementation on aquaponics system-raised tilapia (Oreochromis niloticus X Oreochromis aureus) growth, physiology, and immunology, Journal of Applied Aquaculture, 28:2, 119-130, DOI: 10.1080/10454438.2016.1175830. J. Davies Anuta, Alejandro Buentello, Susmita Patnaik, Michael E. Hume, Ahmed Mustafa, Delbert M. Gatlin III , and Addison L. Lawrence. 2016. Effects of dietary supplementation of a commercial prebiotic (PrevidaTM) on survival, growth, immune responses and gut microbiota of Pacific white shrimp, Litopenaeus vannamei. Aquaculture Nutrition. 22: 410-418. DOI: 10.1111/anu.12257. Mohammed Rumman Hossain and Ahmed Mustafa. 2014. Effects of puerarin on the modulation of health in chronically stressed Chinook salmon (Oncorhynchus tshawytscha) Journal of Applied Aquaculture, 26: 119-131/DOI: 10.1080/10454438.2014.901079. Mohammed Rumman Hossain and Ahmed Mustafa. 2013. Effects of puerarin on the reduction of glucose and promotion overall health in acutely stressed Chinook salmon (Oncorhynchus tshawytscha). ACTA Ichthyologica et Piscatoria, 43 (2): 85–93. Ahmed Mustafa, Shree Dhawale, Jiwon Park and Jin Soung Yoo. 2013. The Validation of Effect of Neutraceuticals on Growth and Immune Response of Nile Tilapia in Cool Water Using a Cluster-Based Approach. Journal of Applied Aquaculture, 25 (2): 132-147. Davies Anuta, Alehandro Buentello, Susmita Patnaik, Addison Lawrence, Ahmed Mustafa, Michaele Hume, Delbeert Gatlin, and Maurice Kemp. 2011. Effects of dietary supplementation of the acidifier Vitoxal-Mionix on growth, survival, immune response and gut microbiota of the Pacific White Shrimp, Litopenaeus vannamei. Journal of World Aquaculture, 42 (96): 834-844. Ahmed Mustafa, Laura Randolph and Shree Dhawale. 2011. Effect of Phosphatidylcholine and Beta-Carotene Supplementation on Growth and Immune Response of Nile Tilapia, Oreochromis niloticus, in Cool Water. Journal of Applied Aquaculture, 23 (2): 136-146. Ahmed Mustafa, Shree Dhawale, and Shrikrishna Dhawale. 2008. Development of a Method for Extracting Macrophages from Zebrafish, Danio rerio and Their Use in Assessing Stress. ACTA Ichthyologica et Piscatoria, 38 (1): 73-77. Mathan Ramesh, Sathyanarayanan Senthis Kumaran, Chokkalingam Kavith, Monoharan Saravanan, and Ahmed Mustafa. 2007. Primary stress responses of common carp, Cyprinus carpio exposed to copper toxicity. ACTA Ichthyologica et Piscatoria, 37 (2): 81-85. Susmita Patnaik, Maryam Moshref and Ahmed Mustafa. 2007. Sustainable Brackish water shrimp farming – A serious thought in India. World Aquacualture, 38 (2):11-14. Ahmed Mustafa, Barbara MacKinnon, and Wojciech Piasecki. 2005. Interspecific variation between Atlantic salmon and Arctic charr in susceptibility to infection with larval and adult Caligus elongatus: effects of skin mucus protein profiles and epidermal histological differences.ACTA Ichthyologica et Piscatoria, 35(1): 7-13. Monica Gensic, Timothy Keefe, Patrick Wissing, and Ahmed Mustafa. 2004. Nutritional supplement and stress response in farmed salmonids. Aquaculture Research, 35: 1117-1121. Emmanuel Udoh, David Erbach, and Ahmed Mustafa. 2004. Neural network facilitated analysis of stress in a biological aspect. IASTED Conference on Software Engineering and Applications, MIT, IASTED/ACTA Press, USA, 25-29. Fast MD, Ross NW, Mustafa A, Sims DE, Johnson SC, Conboy GA, Speare DJ, Johnson G, Burka JF. 2002. Susceptibility of rainbow trout Oncorhynchus mykiss, coho salmon Oncorhynchus kisutch and Atlantic salmon Salmo salar experimental infection with sea lice Lepeophtheirus salmonis. Diseases of Aquatic Organisms, 52: 57-68. Patric Wissing and Ahmed Mustafa. 2002. Effects of iodized-feed on stress modulation in salmonids. VIth International Symposium on aquatic Nutrition. Cancun, Mexico, pp 96. M. D. Fast, D. E. Sims, J. F. Burka, A. Mustafa and N. W. Ross. 2002. Skin morphology and humoral non-specific defense parameters of mucus and plasma in rainbow trout, coho and Atlantic salmon. Comparative Biochemistry and Physiology Part A: Molecular & Integrative Physiology, 132 (3): 527-660. Mustafa, A., Peters, W., Conboy, G., and Burka, J. 2002. Do water temperature and flow have any effect on sea lice development and settlement? Bulletin of the Aquaculture Association of Canada Special Publication No. 5: 53-55. J. F. Burka, G. A. Conboy, D. E. Sims, D. J. Speare, A. Mustafa, N. W. Ross and S. C. Johnson. 2001. Physiological, biochemical, and histological approaches to examining sea lice- salmon interactions. International Congress on the Biology of Fish Proceedings. Aberdeen, UK, 49- 53. (This proceeding has been published as a book in 2001 by American Fisheries Society). Mustafa, A., Rankadua, W., and Campbell, P. 2001. Estimating the cost of sea lice to salmon aquaculture in Atlantic Canada. Canadian Veterinary Journal, 42: 54-56. Mustafa, A., Speare, D. J., Daley, J., Conboy, G. A., and Burka, J. F. 2000. Enhanced susceptibility of seawater cultured rainbow trout to the microsporidian, Loma salmonae during primary infection with the sea louse, Lepeophtheirus salmonis. Journal of Fish Diseases, 23: 337-341. Bowers, J., Mustafa, A., Burka, J., Speare, D., Sims, D., and Conboy, G. 2000. The effects of sea lice, Lepeophtheirus salmonis on the stress response of Atlantic salmon, Salmo salar. Journal of Fish Diseases, 23: 165-172. Mustafa, A., MacWilliams, C., Fernandez, N., Matchett, K., Conboy, G. and Burka, J. 2000. Effects of sea lice, Lepeophtheirus salmonis infestation on macrophage functions in Atlantic salmon, Salmo salar. Fish and Shellfish Immunology, 10: 47-59. Mustafa, A. and MacKinnon, B. M. 1999. Atlantic salmon and Arctic charr: comparative correlation between iodine/iodide supplementation, thyroid hormone levels, plasma cortisol levels and infection intensities with sea louse, Caligus elongatus. Canadian Journal of Zoology, 77:1092-1101. Mustafa, A. and MacKinnon, B. M. 1999. Genetic variation in susceptibility of Atlantic salmon to sea lice, Caligus elongatus Nordmann, 1832.Canadian Journal of Zoology, 77:1332-1335. Mustafa, A., Bowers, J., MacWilliams, C., Fernandez, N., Conboy, C. and Burka, J. 1998. Effects of sea lice infestation on macrophage functions in Atlantic salmon.Bulletin of the Aquaculture Association of Canada Special Publication No. 98-2: 90-92. Mustafa, A. and MacKinnon, B. M. 1997. Inter-specific variation in sea lice infection intensity between Atlantic salmon and Arctic charr Bulletin of the Aquaculture Association of Canada Special Publication No. 97-2:30-32. 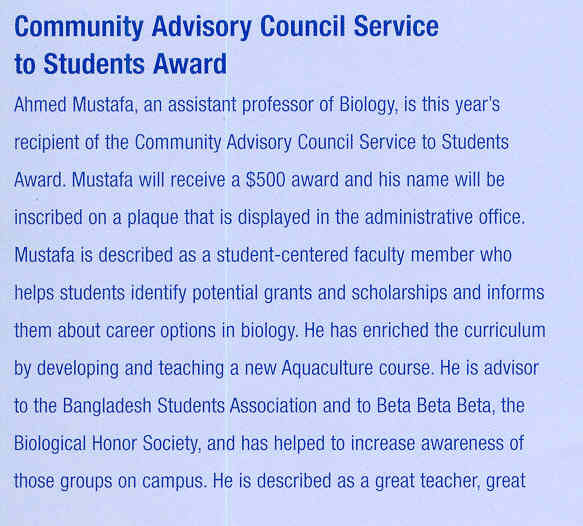 Mustafa, A. and MacKinnon, B. M. 1993. Sea lice and salmonids: Preliminary observations on modulation of the effects of host stress using iodine. Bulletin of the Aquaculture Association of Canada Special Publication No.93-4:99-100.